Wash and halve the tomatoes. Place in a baking dish. Add balsamic, olive oil, wine, dried basil and salt and pepper. Mix well. Meanwhile, slice the french bread loaf into 1 inch thick slices. Line a baking sheet with foil and place bread slices on the pan. Brush butter mixture on evenly to the tops of all the bread slices. Place in the 350 oven for 7 minutes. While bread is baking, mix together ricotta, parmesan and additional salt and pepper. Once you remove the bread after 7 minutes, evenly spread some of the cheese mixture on each slice. Place back in the oven and bake for an additional 5 minutes. Once cheese is warm and bubbly, remove, top with a heaping scoop of tomato mixture and serve! I love all my recipes. I mean I wouldn’t share with all of you if I didn’t feel confident you would enjoy them. But sometimes a recipe creation comes along that just blows the expectations out of the water. 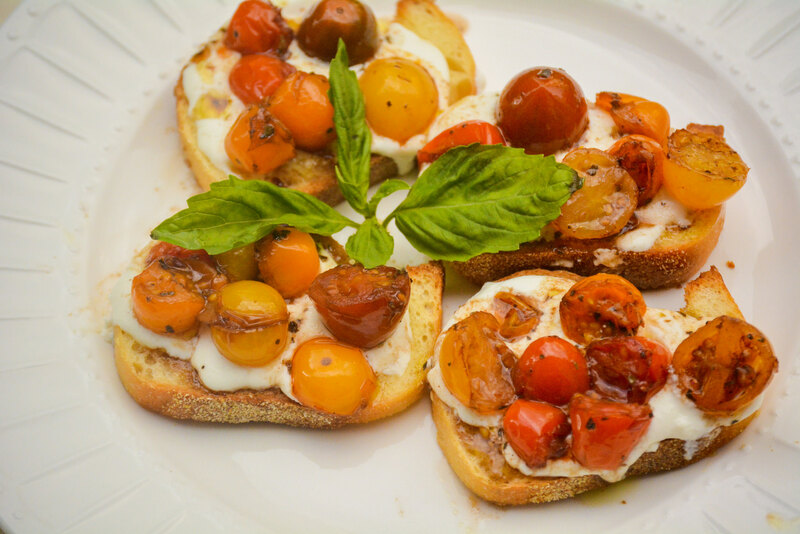 This Warmed Red Wine Tomatoes and Ricotta Crostini did just that. It is beyond swoon worthy. And sorry, you’ll have to try it to see what I’m talking about. The good news- its SUPER easy to make. In a weekly peruse on Pinterest I saw one recipe that baked tomatoes in a bit of red wine. 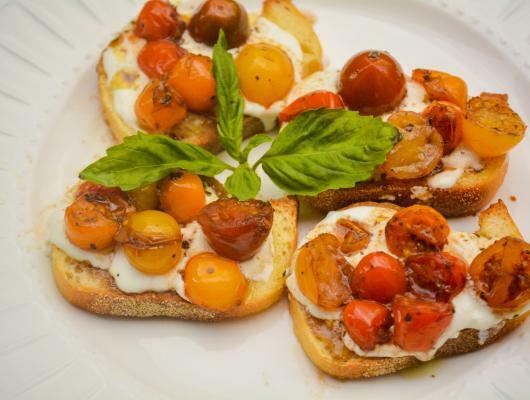 They blister, burst, and the red wine seeps into the tomatoes and juices to create a rich, complex flavor. Well, this was something I wanted to experience for myself. So, I picked up some heirloom cherry tomatoes that looked particularly good at my market. I then halved them and combined them with dried basil, balsamic, oil, wine and some salt and pepper. Whoa. As if those results weren’t delicious enough I paired them with creamy cheese and crunchy french bread. I created garlic bread slices and warm the ricotta (with a little Parmesan). It’s like an explosion of flavor in your mouth that you never want to stop. Let’s just say, a whole tray (ahem a whole loaf of bread’s worth) was devoured by four of us in a few short minutes. With a glass of the wine you used to cook them in – I like a good Barbera! Make them for your next brunch as an alternative to breakfast option!